After a very busy 2018, activities of 2019 are starting well at BAPA. The arrivals did not stop. The search for old aircrafts of Belgian design continues. This month of February was marked with the arrival of a Chickinox Kot Kot in excellent condition. This ultralight is in the process of being cleaned and needs to be restored to the windshield and seats. The dashboard and engine are complete and in good condition. The "Chickinox Kot Kot" (Chicken - Inox - side by side) was invented by Jacky Tonet in 1982 and produced by the Belgian firm Dynali from 1984. Available in two-axis and three-axis versions, this Belgian tube and canvas would be produced for over 10 years and would be sold in more than 1,000 copies worldwide. The space is seriously lacking in the workshop. We ask for help from our members and supporters to find a safe and secure storage site. Developing an exhibition site would be a big step forward. If you know of a former warehouse in good condition that could be made available to the BAPA, contact us via contact@bapa.aero. Do not miss he Expo Renard in Evere. 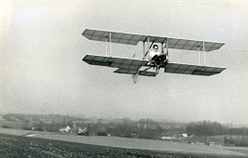 Evere remembers his airport and The Renard Aircrafts through an exhibition to be held from Tuesday, March 12, 2019 at 19h - City Hall of Evere - Espace Delahaut . 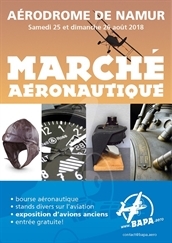 News 20180820: Aerojumble in Temploux and exhibition of the Slingsby T-38 at the open doors of "Les Accros du Servo"
In April 2018, after a few weeks of hectic work to prepare it, the front and rear fuselage of our B-25 left BAPA's workshop to be used in a movie. It came back from his mission on Monday, September 24, 2018. Upon departure, the fuselage was mostly empty and had to be completed with parts provided by BAPA (armor, radio, instrument panel, ...) and by the film company (perspex, escape hatch, ...). The deal was that any equipment added to the B-25 by the film company for the purpose of the film was becoming property of the BAPA. The deal was perfectly respected. The end result is fantastic!! 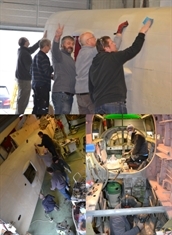 Our B-25 has now all its perspex and all the escape hatch, the two entrance hatch, brand new windscreen & sliding windows, side gunner windows, turret perspex dome, pilot and co-pilot seats, control column and original ammunition boxes. The instrument panel, that we provided with most of its instruments, has been installed. Many other originals equipments, not even used during the film, have been provided as well. However, it must be agreed that some items have been installed for movie purpose only & are not historically/technically correct. Those items will be gradually dismantled and replaced by original parts. BAPA can therefore resume the restoration this autumn. 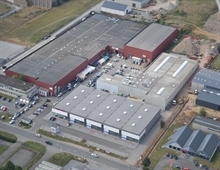 On Saturday 25 and Sunday 26 of Augustus, BAPA will be pleased to welcome you at the aerojumble in Namur Airfield (Temploux) to participate to the annual BAPA open doors. Given the success of open doors in 2017, we need help to welcome the many visitors expected. In the same time, BAPA presents the Slingsby T-38 Grasshopper at the open doors of "Les Accros du Servo" in Bossière (Gembloux). Both locations are clearly indicated on the presented posters (click on the posters for more info). News 20180501: Thanks to volunteers, Mission B-25 accomplished ! Mission accomplished, the B-25 was ready on time for its transport to a specialized workshop for much needed repair work. The BAPA warmly thanks the volunteers who worked to achieve this goal. cramps to the poor fellow that has to work in there. paint work of the rear fuselage to start 4 days ahead of schedule. outer part of the rear fuselage. This allowed us to complete many other much needed tasks. We are very grateful for the help provided by those aviation enthusiasts. This Friday, February 16, 2018 the BAPA welcomed the Red Devils to thank them for flying over the workshop during the open doors. Lt. Col. Avi Jean Van Hecke, Cdt. Avi Yves "Meel" Meelbergs and Cdt. Avi Christophe "Tcholle" Deroubaix did us the honor of visiting our workshop and current projects. 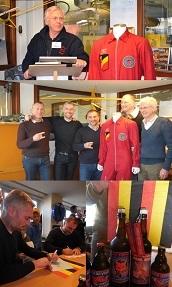 They were accompagnied by Laurent Bladt, grandson of Robert "Bobby" Bladt, first leader of the "Red Devils" in 1959, the patrol then flew on Hawker Hunter. After a short welcome speech and a gift, the BAPA had the privilege of introducing its activities to the pilots of our famous acrobatic patrol. All the guest had the chance to get to know each other and to exchange a few words over the expanded lunch. This cold morning of Saturday november 18 saw a recovery team at Moircy to remove an old glider from its hidden place. The open doors of an old barn revealed a Schleicher Rhönlerche II registered OO-ZUP. Cancelled from the Belgian register on 13/1/1978, it was aquired by one of its pilot Marcel Janssens in the early eighties. Never used again and stored since that time, it was given to our association by the family Janssens thanks to informations of Firmin Henrard. 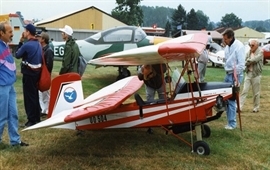 The Rhönlerche is a classic tandem training sailplane and it was widely used in Belgium by the Cadets de l’Air and most of the aero-clubs. 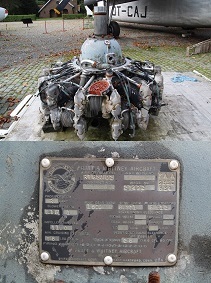 Monday, october 9th, a Pratt & Whitney R1830-92 radial engine has rejoined our collection. 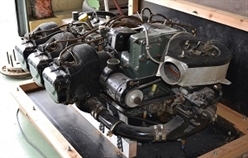 Mainly fitted on the Douglas C-47 Dakota and the Consolidated Catalina aircrafts, it was a spare engine not used for the Melsbroek Dakota Museum’s own Dakota and given to our association. One cylinder is missing as all the rear accessories casing and we already invite everyone who can help with these parts or join us to restore this engine. We are grateful to Jean Dries, the 15th Wing for the loading, Kipar for the van and Michel Huart for the information. On Saturday September 16th, despite of unattractive meteorological forecasts, this year's open doors is closing off with great success. The atmosphere was very pleasant and familiar. The visitors were able to observe the new acquisitions as well as the progress of the BAPA projects and, in particular, the spectacular evolution of our B-25 . Bruno Scordo presented the aerodynamic wind tunnel Boréa and communicated his passion and his enthusiasm to all visitors. BAPA had the pleasure to welcome members of the Belgian Military Vehicle Trust who came for a courtesy visit with the "Woman Army Corp" and some WWII vehicles. The sky was particularly clement above the BAPA to offer a breathtaking aerial show with the exceptional passage of the national acrobatic team of "The Red Devils". Like every year, several stands were reserved for aviation enthusiasts who could buy books and collectables. Particularity of this day, the visitors were able to rub shoulders with cartoonists for a signing session. BAPA warmly thanks all the volunteers who helped us to make those Open Doors a great success. With the spring come new visitors, among of them, the Witmeur family, the mastermind of the Belgian Military Vehicle Trust (BMVT), which is an association of Allied Vehicle Owners of the WWII. On the first weekend of August, they organize a large gathering at Fort Lantin and they invite us to participate with the B-25, that's all. We were excited because it was the opportunity to get a move on to the beast and give a maximum focus on our emblem and reach a wide audience. The task is huge because of a new dolly has to be made to carry it and all the structural parts used to put up the B-25 on the dolly have to be repaired. Furthermore, the BMVT overloads his demand and asks us to paint the B-25 and put the glasses in it ... At this moment, everything depends on parts that are manufactured externally and do not arrive. 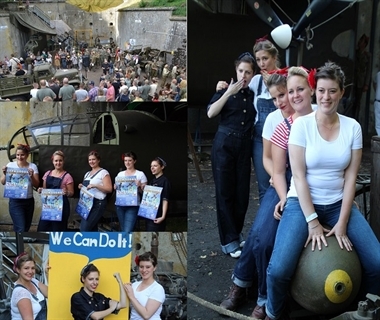 One month before the event, nothing could be done and we were about to give up when Wallis Witmeur makes us to know that the B-25 is her headlining. 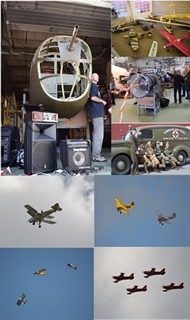 What is more, it is the 30th anniversary of the association and the 10th anniversary of the WAAF which requires a plane to show all their talents to create an atmospheres of time. Miraculously, the main parts that all depend on arrive at the beginning of July (thanks, SONACA!). And the process goes on. Unfortunately, after any repair, there is always more damage to be repaired, which reduces the working time for the paint. In the end of July, the team at work on de B-25 keep growing, almost all other projects are put on hold to devote the maximum resources to the necessary work at the B-25 and his dolly. The workshop is open every day in an atmosphere punctuated by the sounds of the riveter and grinder, flashes of welding and various swearings. Another miracle happens, our friend Thibaut, who has just learned to weld, reveals himself particularly gifted. The teams of volunteers are on their knees but, with 3 days of transport, the nose is raised gently on its cradle thanks to Roland and its airbags. The B-25 is ready! The BAPA Reserve teams are taking action to prepare and supervise logistics. Detail, it is necessary to move out half of the workshop to pass the B-25 towards the loading dock. The transport is tricky: Our package is 6m long and 3,05m high. Wallis Witmeur struggles and finally finds the carrier able to taking over our big package. But now, the latest surprise, the dolly of the B-25 is designed to run on platforms and not to be lifted with a crane. The only way to lift the B-25 without damage on the structure is to place the anchor points on the base of the dolly, which is 1.5 m below the center of gravity of the load. The download at Fort Lantin was epic. A few beers were usefull to calm the nerves of the "logistics" team. Another ultralight has rejoigned our collection thanks one of our member. The Romibutter is a Butterfly with a new fuselage fitted with an engine in frontal position. This unique ULM was conceived and built by Michel Rocourt, hence the name RO+MI+Butter. It ended its flying career some years ago and was preserved by Alain Blondiau until now. It is complete and exhibited at the workshop. It is one of the oldest Belgian registered ultralights to be preserved. More info soon on our website. 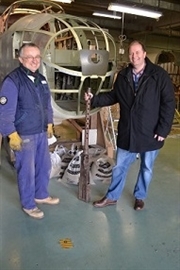 BAPA warmly thanks Mr. Vincent Pécriaux for the donation of a Browning .50 "aeronautical version" machine gun in quite good condition. The internal mechanism and the barrel are missing. This machine gun has already found its place. It will be installed in the nose of the B-25. BAPA currently has two nearly identical Browning .50 "aviation" machine-guns. With these two uncomplete models, we intend to realize the drawings of a complete machine-gun and to be able to reconstruct replicas as close as possible to the originals. This Saturday december 3 saw the arrival of our new acquisition : an ultralight Aviasud Albatros AE209 . It was given by Michel Baudrux who based it at the nearby Liernu ulmodrome. Except the propeller and two instruments, it is complete and in state of airworthiness. The Albatros was designed by the belgians engineers Bernard d’Otreppe and François Goethals who founded Aviasud at Frejus in France to produce their others famous ultralights : the Sirocco and the Mistral. Although french registered, the Albatros find its place thanks its belgian linkage in our collection. Many thanks to Michel Baudrux for this beautiful gift. Despite a morning uncertain weather, the BAPA open doors were held successfully and closed in sunny weather. Many visitors came to watch our workshop and the progress of our projects and expressed their satisfaction. The exhibitors are satisfied with their day and have already indicated that they planned to come back next year. 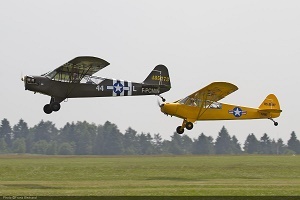 On Saturday 27 & Sunday 28 of August, the BAPA will be pleased to welcome you at Saint-hubert Airfield, during the Aerovintage. Come and pay us a visit to share a friendly moment. On Saturday 25 & Sunday 26 of June, the BAPA will be pleased to welcome you at Florennes, during the Belgian Air Force Days. This engine was delivered in perfect condition. This piece will be exposed after setting on a frame. BAPA warmly thanks Mr. Roger Poncelet for his donation and his confidence. 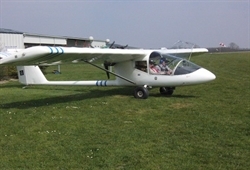 The Max Williams 29 «Jeunesse» (modified) was given by Mr. Pletinckx in april 2016. This new piece of our collection is in a quite good condition. This glider need to be cleaned and the fabric covering need to be replaced. http://www.bapa.aero. The purpose of this new website is present the activities en events of the association. www.bapa.aero present the workshop activities, thes collections, the flying squadron and BAPA's master piece: the B25 Mitchell. Some scenes were shot this saturday January 23th aboard our B25 at the wokshop. These scene are incuded in a short film witch will be presented at the Brussels International fantastic Film festival 2016. This short film is directed by Olivier Mercks (Member of BAPA).